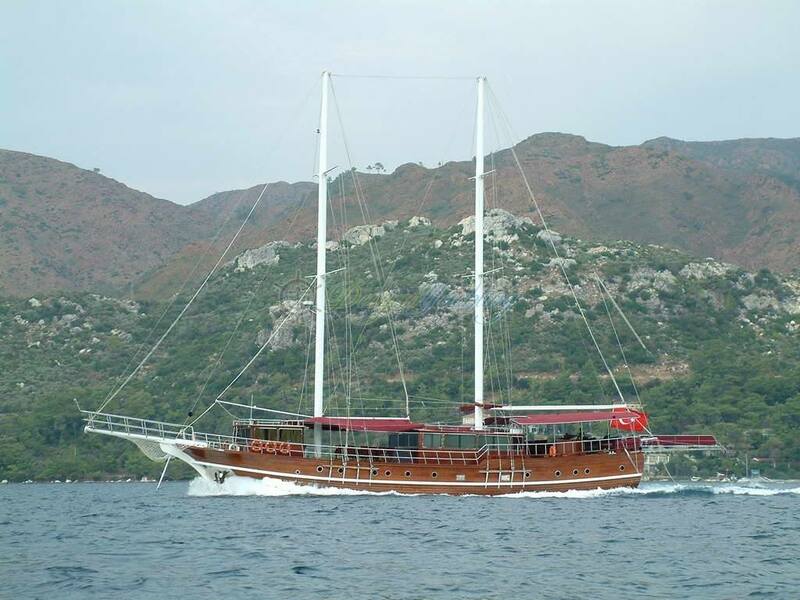 Turkish Gullet CELIK DE S offers private charters from Gocek or Marmaris through some of the most stunning waters along the Turkish Coast. 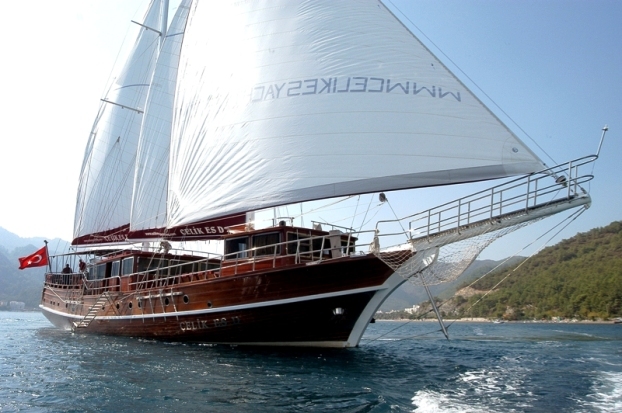 This 32m sailing ketch has a beautifully finished laminated wood hull and provides plenty of teak deck space to relax. 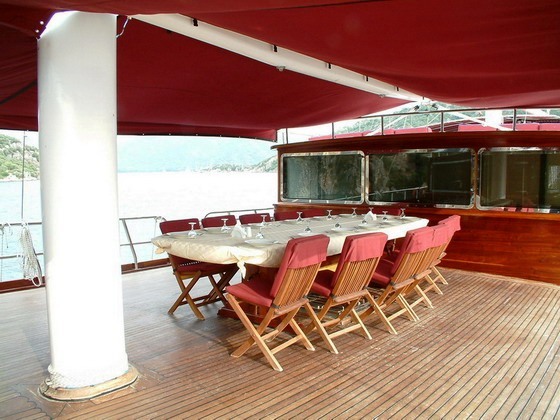 El Fresco dining for 14 guests is a pleasure on the large table located on the forepeak of the yacht. 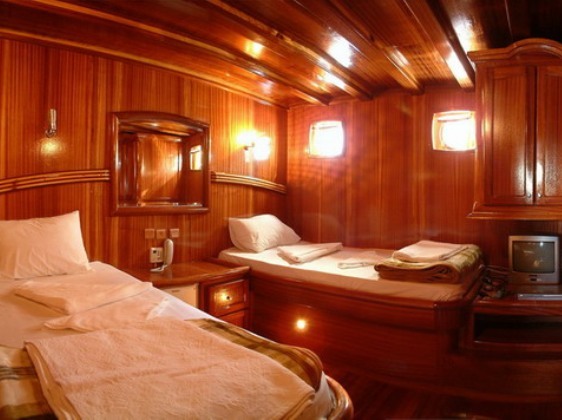 The fully furnished Saloon has further dining facilities for 14 guests and a fully fitted bar. 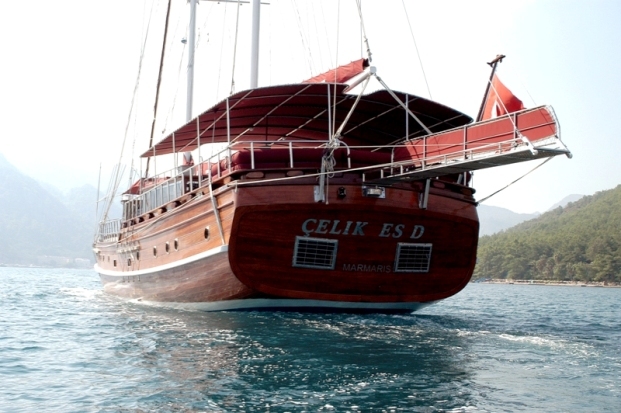 The interior of CELIK DE S is finished with Sapelli Mahogany and is air-conditioned throughout. 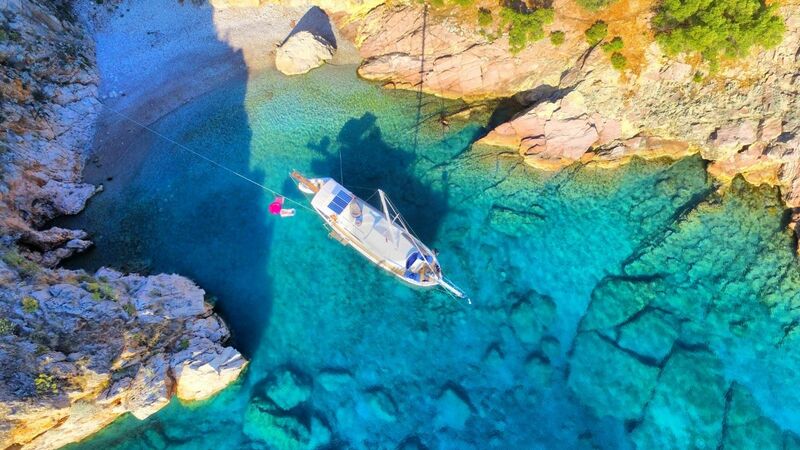 The crew includes a Captain, talented chef and two deck hands whose experience and professional approach will ensure an Eastern Mediterranean vacation you will remember for a life time. 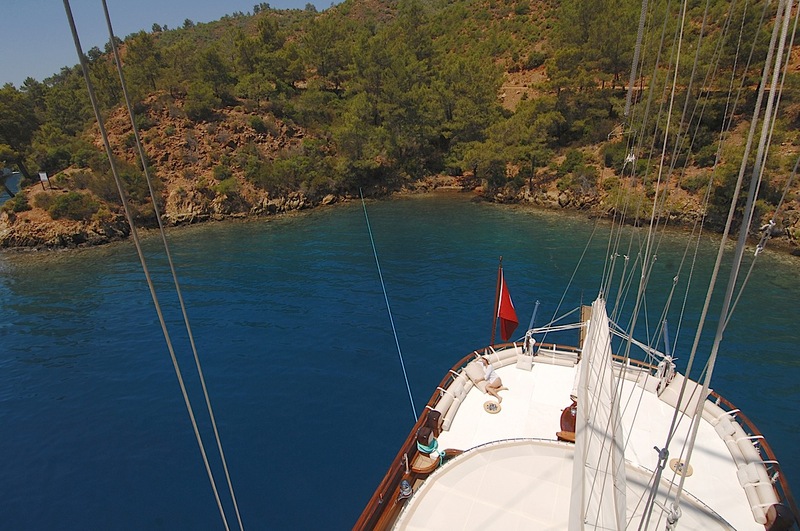 Sailing Ketch CELIK DE S offers accommodation for up to 14-16 guests in seven cabins consisting of 5 doubles and 2 twins. 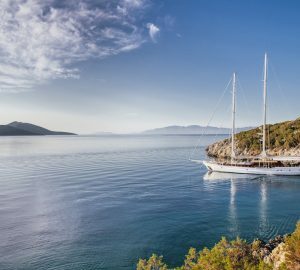 All of the cabins have private en-suite bathrooms, Air conditioning, hot water, TV, VCD player, music system and inbound telephone systems. The crew of 4 have separate crew cabins. 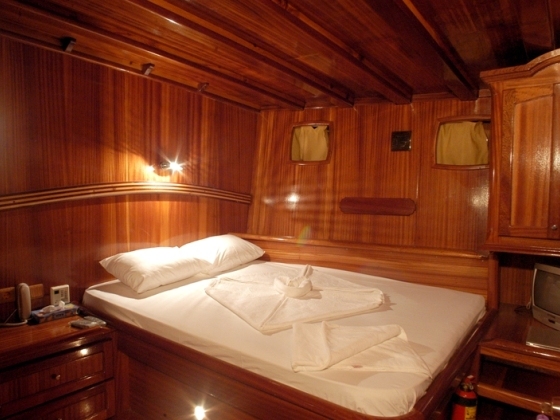 The impressive fully furnished Saloon provides comfortable dinning for 14 and an American bar. There is also plenty of outdoor space for relaxing and dinning. 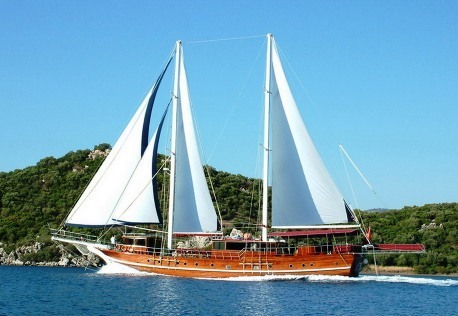 Turkish Gullet CELIK DE S offers the following equipment and amenities on board: Furling Genoa, Jib, Mainsail, and Mizzen, A VHF marine radio , GPS - Chart plotter , Radar, compass, depth sounder – speed log, projector light, mobile telephone, CD-Tape , DVD player, TV, refrigerator, deep freezes, cooker and oven, dish washer, ice maker, washing machine, water boiler , electrical pressurized water system (4000ltr capacity: hot –cold, air conditioning in all cabins and saloon, dinghy with outboard, sun awnings, sun mattresses, deck shower, deck chairs, sea ladder, snorkeling & fishing equipment, windsurf, a canoe and full regulation safety equipment.